Tickets are sold by section. IF ONE SECTION IS SOLD-OUT, PLEASE TRY ANOTHER. Audience members are seated within each section on a first-come first-serve basis. Lobby opens one hour before showtime. 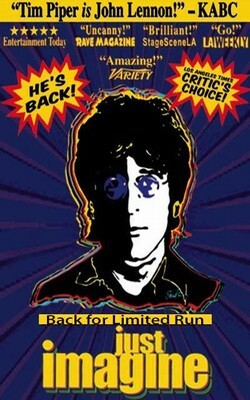 True Rock Theatre presents a limited engagement of the critically acclaimed rock & roll production of “Just Imagine” starring Tim Piper as John Lennon. Imagine John Lennon returns for one last concert and YOU ARE THERE!. "Just Imagine" transports you to another place and time, putting you 'one on one' with the musical legend who shook the world. Experience Lennon's timeless musical genius as Tim Piper takes you through John's life from tumultuous childhood to worldwide pop music superstar to groundbreaking social icon that influenced generations. You'll share a unique perspective on John's life, the stories behind the songs, and revealing insights about the birth of the Beatles, the pressures of super-stardom, and John's relationships with his loves and fellow Beatles.